What Size Tank for Goldfish? Researching fishkeeping – how, what and why? Do fish grow to the size of their tank? Wild caught or captive bred? Welcome to our website, before you have a look around we thought we should tell you a bit about us, what we’re doing and why. Between us we’ve got several decades of fishkeeping experience in coldwater, tropical freshwater and marines. We keep fish, invertebrates, and reptiles. We recognise that ‘time served’ doesn’t automatically make you an expert, but we’re good at what we do and we hope the information we provide will bear that out. We also know there is an infinite amount still to learn and experience and that anyone who claims they’ve never done anything wrong, or knows everything, isn’t being entirely honest with themselves. Or with you. We’d been rumbling on about doing something for a while, it had been lurking in the back of our minds, a general discontent with the aquatics industry, certain elements of the fishkeeping hobby and the general public perception of aquatic creatures (it’s just a fish …). Then someone on a fishkeeping forum posted a link to an article about how to stop the giving of goldfish as fairground prizes, it was posted in the coldwater section but it got us thinking – it’s not just the responsibility of goldfish keepers to deal with problems relating to goldfish. Problems with aquatic welfare reflect on the entire hobby, and as such it’s down to the entire hobby to deal with these problems. Goldfish (or ‘goldies’, as you’ll often see them referred to) are not the only fish to get a very poor deal and suffer from “it’s just a fish”. We wanted to start something that could grow, that could cover more than goldies as fairground prizes. It’s not just a fish; it’s a life, it’s a species in decline, it’s an ecosystem on the brink of destruction, it’s heading for extinction, it’s totally unsuitable for the home aquarist … the list is endless. 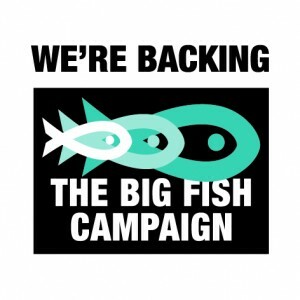 We wanted to find a way to provide a cause to sign up to for all those who are concerned about bad practice and poor advice, about inappropriate products, about aquatic environmental issues, about all things fish. Something to help those who want to do something but don’t know where to start. So we started INJAF. We didn’t want to be all talk and no action, get all riled up and then fizzle out. It was time to put our money where our mouth was, so to speak. We know change won’t come overnight but if we don’t try we’ll never know what we can do. We provide information, advice and guidance that we believe in, we link to causes we love and we report back on anything we do and any results we get. If we recommend a product it’s because we like it. We don’t recommend products we don’t believe in and we don’t criticise products without good reason and personal experience. We aim to campaign, raise awareness and educate. We want to treat the cause and not the symptom; we want people to understand why it’s not just a fish. We want to remove the demand for things like goldies as fairground prizes, remove the demand for ‘tankbusters’, remove the demand for unsustainable products. We think education is the way forward; better informed people can make better informed decisions. Have we just detailed our life’s work? Hopefully! Copyright © 2019 INJAF. Powered by WordPress. Theme: Accelerate by ThemeGrill.